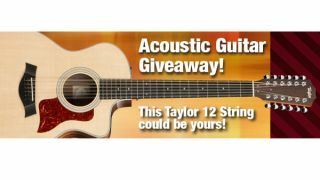 Deep down, every guitarist wants a 12-string acoustic among their arsenal, and now you can win a Taylor 12-string 254ce Deluxe - worth £1,331 - just by answering a few guitar-related questions! By filling out the survey, you're automatically entered to win - five runners-up will bag a year's supply of guitar strings, too. The survey closes on 28 February, so head to the link above now to be in with a chance of winning. One entry per person. Year's supply refers to 12 sets of electric or acoustic guitar strings. No purchase necessary to enter or win. Must be 18 years or older at time of entry. Open to legal residents of France, Germany or United Kingdom except where prohibited by law or excluded as noted in the official rules.